Tresanti Entertainment Center w/Beverage Cooler Wesleyan TS-6439-C247S3. The Wesleyan collection has a transitional design style and allows for such customization as adding an electric fireplace, dual zone wine cabinets and even an integrated beverage center. Everything has a place with the Wesleyan's abundant storage features, which include two full extension drawers and generous side storage compartments with adjustable shelves. 1 x 60" TV Console TS-TC60-6439-C247. 60" TV Console (For up to 65" TV) - 60"w x 19.5"d x 30"h.
• 2 Side by side storage cabinets - 27.5"w x 16.75"d x 15.25"h.
• Two bottom drawers - 26"w x 15"d x 5.5"h.
66" Fireplace TV Console - 66"w x 23"d x 37.25"h.
Beverage Cooler Pier - 20.75"w x 21.25"d x 80"h.
• Full extension drawer: 17"w x 14"d x 3.25. 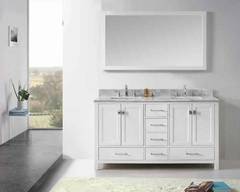 • Bottom cabinet door conceals: 17"w x 14"d x 3.25"h.
• Top cabinet: 18.25"w x 19.25"d x 33"h.
Left/ Right Storage Pier (Each) - 20.75"w x 21.25"d x 80"h.
• 2 Full extension drawers: 17"w x 14"d x 3.25"h.
• Bottom cabinet: 18.25"w x 19"d x 26.25"h.
Bow front shaped media mantel. Pass through holes for easy wire management and ventilation. 2 side by side storage cabinets with adjustable shelves. Wood framed doors with tempered beveled glass and concealed Euro hinges. Brushed nickel hardware gives the console added style. Multi-function media cabinet w/ integrated wire management. Brushed nickel base and hardware. Two bottom drawers feature English dovetail design and full extension ball bearing glides. Designed to hold up to a 65" television. Full length, open center shelf for media component storage. Two side cabinets with adjustable shelves for extra storage. Two framed, beveled glass doors with faux drawer pulls. 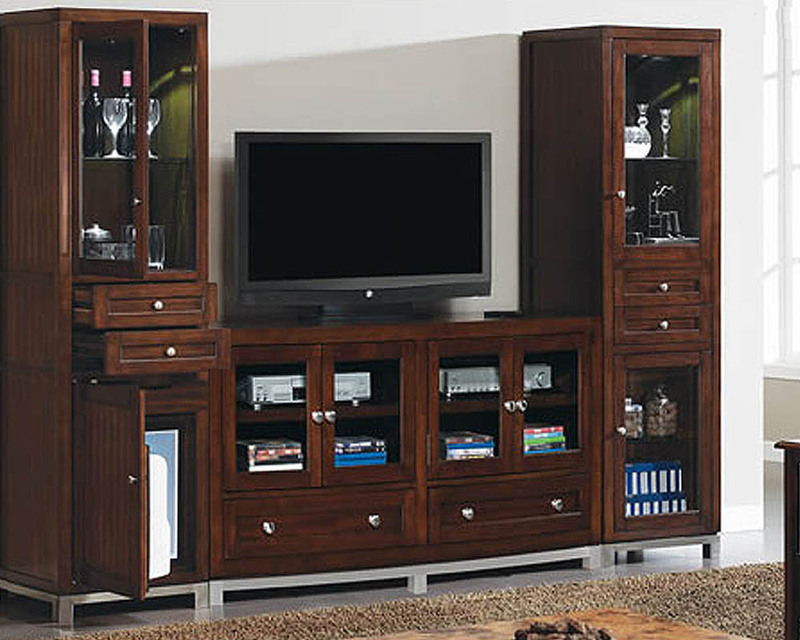 Multi-function media cabinet with integrated wire management. A full extension drawer for added storage. Bottom cabinet door conceals an extra full extension drawer and a beverage cooler. Thermoelectric technology provides a whisper quiet, vibration free operation. Contains no toxic refrigerants or ozone depleting chemicals. Elevated, brushed stainless steel base. Cooling temperatures between 45° to 65°F (7° to 18°C). 2 Tempered glass doors with 3-way adjustable concealed euro hinges and adjustable glass shelves. Top cabinet features interior touch lighting. Bottom cabinet for additional storage.